The Tustin Hillbillies participating in the Annual Wild Rose Days Parade. The event draws over 60 entries. This float, demonstrating the tongue-in-check civic pride of "residents" of nearby unincorporated Tustin visiting the metropolis of Wild Rose, is just one example. 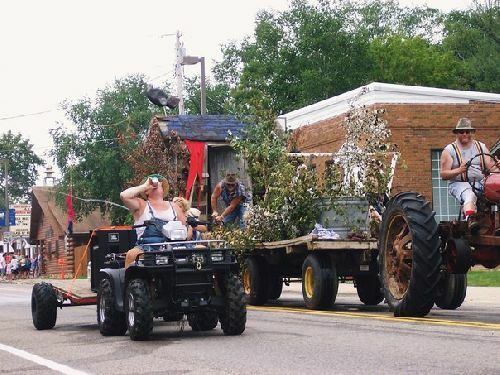 Other entries each year include the Wild Rose Marching Band under the long-time direction of Mary Stepanek, the lawn tractor pull contestants, many antique farm tractors, classic cars featured in the fall's Classic Car Show, and whichever politicians are up for election. Not to be missed, this even draws a few thousand people and the parade takes over an hour. What is there to do in the Wild Rose area? Wild Rose is just a short car ride from the Fox Valley, the Milwaukee metro area, Chicago, and Madison. We have lots of activities to explore. At the heart of many activities in the Wild Rose area is our location in a beautiful rural setting. Our Natural Resources are central to activities for visitors of all ages. If you haven't already checked it out, visit the Classic Car Show by clicking on the tab on the menu. Each year this event held the third weekend in September gets bigger and better. In 2010, the local businesses all adopted a lamppost and scarecrows started making an appearance on our Main Street to watch the classic cars as they made their Friday night cruise through Wild Rose. The scarecrows are on display into October, so if you miss the cruise you can still come stroll our Main Street and take in the quaint, appealing charm of our village decorated by the people who live and work here everyday. You can also see a slide show of these happy decorations on our homepage. The perennial answer to the "I'm bored." statement of children, teenagers, and young adults is a short day trip to the Wild Rose area. Whether it is winter, spring, summer, or fall, there is lots to do. To give you some ideas, we've outlined some day itineraries to get you started! Recently renovated, the Wild Rose Fish Hatchery is a great place to learn about Wisconsin's fish stocking program for Lake Michigan. Download the brochure on the renovation and the importance of the fishing industry in Wisconsin. Wild Rose is central to many Class A Trout Streams. Fishing licenses can be purchased at Lauritzen's and Mr. Ed's Place. 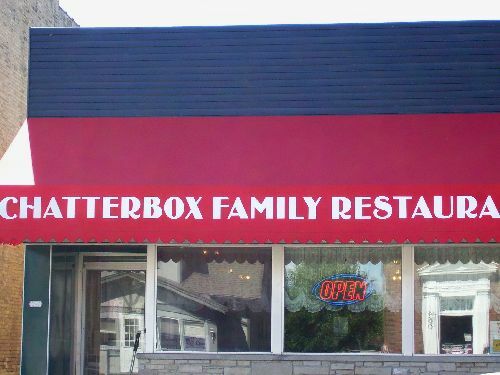 Serving breakfast, as well as lunch, is the Chatterbox Cafe. Reknown among the locals as the hang-out for our local politicos, movers and shakers, the Chatterbox on Main Street has a complete breakfast menu served from open to close at 2 PM. If your family snowmobiles, Wild Rose should be your destination. Marked trails come into the village from all directions, allowing easy access to gas up your go machines and connect to trails leading to all parts of Waushara county and beyond. Wild Rose has trails leading to Lauritzen's BP Amoco and Sports Shop on the north end of town and Larsen's Co-op on the south end of town. Both offer hot beverages, munchies and sandwiches, and other supplies. Larsen's also offers fast food dining with Picadilly Pizza. If a relaxed atmosphere is what you desire, the Pioneer Pub in the center of town is what you need. Serving lunch and dinner from a full menu, the Pioneer Pub also offers a bar, several large screen tvs, pool tables, darts, and other video games. Whether it is one of Kevin or Jocelyn's nightly specials, or a sandwich, or full meal; you won't be dissapointed. The food and the family-friendly atmosphere at "the Pub" is great! If getting to the slopes is high on your list of winter fun, Nordic Mountain is not to be ignored! Nordic Mountain offers fun whatever you passion! If fun on the slopes is something you would like to try, but don't know where to start, Nordic Mountain has instructors in snow boarding, and downhill skiing on staff. Family friendly activities for all ages and levels of expertise abound. Their lodge features warming beverages, a munchies menu, and a game room when you need to take a break from the outdoor fun. And, if you are a parent of an X-treme winter sports enthusiast (like me)-- a fireplace near a huge bank of windows with a wonderful view of the slopes so you can cover your eyes with your hands if you "OMG, can't look"/watch your teenager as they skillfully maneuver downhill!